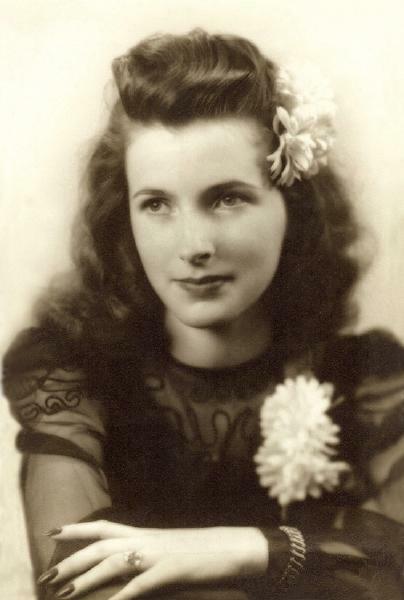 Joyce Ann Bigelow was born on 28 August 1928 in Delevan, Cattaraugus County, New York. William H. Bigelow and Anna C. (?) appeared in the US federal census of 1 April 1930 in Yorkshire, Cattaraugus County, New York, at Olean Street. Other members of the household included Joyce Ann Bigelow, Wesley Floyd Bigelow, Florence Mae Plugh and James Duane Bigelow. Also, lodging in the household and working on the farm was Florence's brother Robert F. P[l]ugh (age 16). She married John Kreitner on 31 December 1946. The following appeared in the Buffalo Courier-Express: [Died] Wesley F. Bigelow of Yorkshire, N.Y., Oct. 31, husband of Florence Plugh Bigelow; father of James of Eden, Mrs. John Keitner of Clarence Center and the late Wesley Jr; brother of John of Ischua, Mrs. Whyy Joslyn of Detroit, Mich., Mrs. Leslie Flott of Watervilet and the late Florence Knight of Arcade; also survived by nine grandchildren. Friends may call at the Funeral Home of W. S. Davis Inc. in Arcade where a prayer will be held Thursday morning at 9:30. Funeral services from SS. Peter and Paul's Church at 10 o'clock. Interment in SS. Peter and Paul's Cemetery. She married Francis Jerome Gallo on 15 February 1985 in Charlotte County, Florida. Joyce Ann Bigelow became a widow at the 21 November 1991 death of her husband Francis Jerome Gallo. Joyce Ann Bigelow died on 4 April 2012 at age 83 in Naples, Collier County, Florida. She was interred at Naples Memorial Gardens Cemetery, North Naples, Collier County, Florida. The following appeared on 13 April 2012 in the Naples Daily News: Joyce Ann (Calderone) Gallo, 83, of Naples, FL, formerly of Yorkshire, NY, went to be with the Lord on Wednesday, April 4, 2012. Joyce worked in the mortgage lending field and was employed by Barnett Bank of Naples for several years, then as Director of Volunteers at the Conservancy of Naples, and was a past President of the local chapter of the American Business Women's Association. Joyce was a member of St. Peter the Apostle Catholic Church, Naples and also attended St. Elizabeth Seton Parish (Golden Gate). She is survived by two sons, David (Carol) Kreitner of Sunrise, FL, and James Kreitner of Rockville, MD; two daughters, Pamela Johnson of Austin, TX, and Deborah (Richard) Joudrey, of Tampa, FL; five grandchildren, Sara Kreitner, Jean-Luc Kreitner, Olivier Kreitner, Leslie Joudrey, and Richard Joudrey, Jr; and one great-grandson, Eli Lurvey. She was preceded in death by her beloved husband, Francis Gallo. A memorial service will be arranged at a later date by the family.